Limetree Public Relations got off to a blazing start. Demonstrating various fire training scenarios required meticulous event planning and it paid off as the event attracted huge media attention. Feeling raw from redundancy but with bags of PR experience gathered from the corporate world Bridget took a huge step into the unknown as set up Limetree Public Relations in autumn 2006. Having gained all her experience through working for British Gas, Centrica and Manchester Airport she felt well equipped to take on her own clients. Limetree PR launched into business taking on an international launch event from associated with her previous employer Manchester Airport. 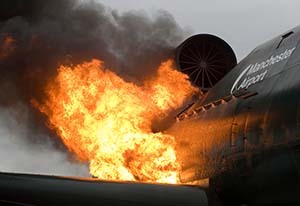 Organising an event with Manchester Airport Fire Service and Simulation Terrs got the company off to a blazing start. Demonstrating various fire training scenarios attracted huge media attention and meticulous event planning. In the early days Event Planning was the main stay of the business planning the events calendar for Business Link North West, a 6 month roadshow across the regions for business owners and their AGM events kept me furnished with new contacts. Co-ordinating opening events for two Waste Recovery Plants both at short notice required detailed event management and supplier co-ordination. Media Relations is just one of the challenges on such high profile occasions. Needless to say the launch of a Jamaican Patios New Testament Bible appealed to the media and required multi interviews across the country. One of my favourite clients has been The Pitch film competition. A regular client who I have supported at key points in the competition calendar. I have loved working with budding film makers and following their story through to the finished film, living the highs and lows of emotions with them. I’ve maintained membership with Chartered Institute of Public Relations and have been a member of the North West committee for the last six years. Professional development is important to me as I carry on learning the new technologies of this industry and today am a CIPR accredited PR practitioner. Today all my clients are closer to home and are served on a regular basis. My key aim is to really understand their business, their key goals and work with them to support their business to grow. Looking back over 10 years the fashion has certainly changed and I’ve certainly changed in my approach. I focus on key services which Limetree PR excels in. We have become much more digitally focussed and social media has become an important communicating tool. We’d never heard of twitter 10 years ago and today we couldn’t live without it!